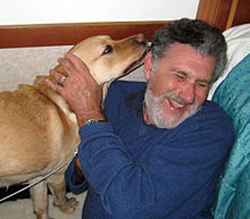 Emeritus psychology professor Elliot Aronson at home with his new guide dog Desilu. 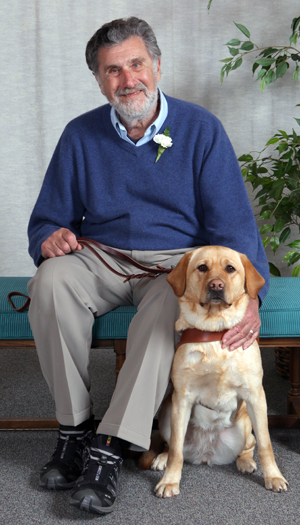 Aronson and Desilu on graduation day in February at Guide Dogs for the Blind in San Rafael. Not by Chance Alone: My Life as a Social Psychologist, the critically acclaimed memoir by Elliot Aronson, emeritus professor of psychology at UC Santa Cruz, has been nominated for the 2010 Northern California Book Award in Creative Nonfiction. The awards are given each year by the Northern California Book Reviewers for the best books by northern California authors. The awards will be announced at the 30th annual award ceremony Sunday, April 10, 2011, in the Koret Auditorium at the San Francisco Main Library. Aronson has also been nominated for the Constantine Panunzio Distinguished Emeriti Award that recognizes one or two outstanding University of California professors in the humanities or social sciences for scholarly work or educational service since retirement. The selections will be announced April 15. Previous UC Santa Cruz winners are Hayden White, History of Consciousness, 2001; G. William Domhoff, sociology, 2007; Thomas Pettigrew, psychology, 2009; and Harry Berger Jr., literature, 2010. The UC Santa Cruz Emeriti Association nominated Aronson for the award in recognition of his extensive teaching, research, and writing since his 1994 retirement. Association president John Marcum wrote in the nomination letter that Aronson's scholarly work post-retirement "would be remarkable" for a sighted person; "for someone coping with the loss of his sight, it is hard to find a way to describe Elliot's success." Over the past 17 years, Aronson has published numerous articles, four scholarly books in addition to Not by Chance Alone, and another volume, a children's book "just for fun." Aronson has progressively lost his sight from macular degeneration. He continues to write and correspond using voice recognition software and has been able to get around using a cane. But Aronson recently was able to dispense with his cane, having acquired a guide dog, a yellow Labrador retriever, "Desilu," after spending three weeks in training at Guide Dogs for the Blind in San Rafael. He described the training as "quite an experience. They worked us 14 hours a day until we became almost as smart as our dogs," Aronson said.